Twitter has always been popular amongst America’s largest corporations, and a new study has revealed that 83 percent of the Fortune 500 are now active on the platform, an increase of 6 percent from last year. In their survey the University of Massachusetts Dartmouth Center found that 413 Fortune 500 companies have tweeted in the past 30 days, with seven of the top 10 – Wal-Mart Stores, Exxon, Chevron, Phillips 66, General Motors, General Electric and Ford Motors – updating regularly. 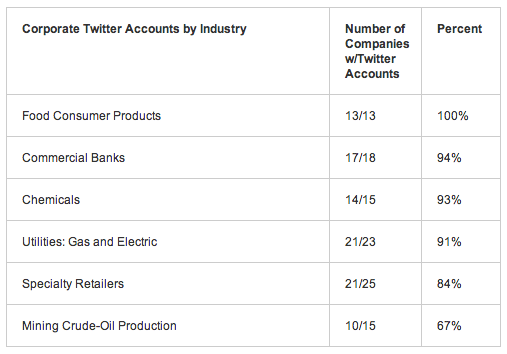 Rated by industry, 100 percent of food consumer product companies in the Fortune 500 company are active on Twitter, with commercial banks (94 percent) and chemicals (93 percent) firms also highly placed. 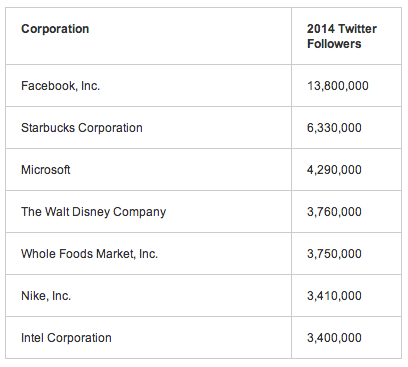 Facebook has more Twitter followers than any other organisation in the Fortune 500, ahead of Starbucks, Microsoft and Disney.